The first major re-sort is in the midst of happening on the shelves behind me. 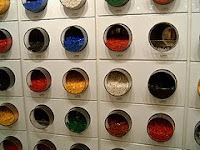 Plastic tubs are rapidly filling up with each color. I have a lot more red, black, and light grey than I expected. I'm thinking I could make a LEGO argyle sweater. It's hard to leave behind your initial sorting scheme, but when it becomes unwieldy for building, a man has no other choice than to dump it all out and start fresh. In the interim, there is something satisfying in having a row of shelves that look like Pick A Brick cubes in the LEGO retail stores.